For the past several months I have been working on a Lammas weekend campout for women’s group gathering. The moment I was offered the opportunity to create a women’s group ritual for Lammas, I knew instantly what I wanted to create and share. My vision was one of letting go in order to take back control of our true selves. My inspiration for this ritual came from a period in my life that was crucial to the development of my spirituality in terms of self-awareness, and most importantly self-esteem.Many years ago I became a Maenad, an initiated Priestess of Dionysos. I look back fondly at those wild rites of drunken ecstasy with laughter and joy, exploring free expression with beautiful fellow Maenads. I’ve named the developing ritual The Beating Heart of the Wild. 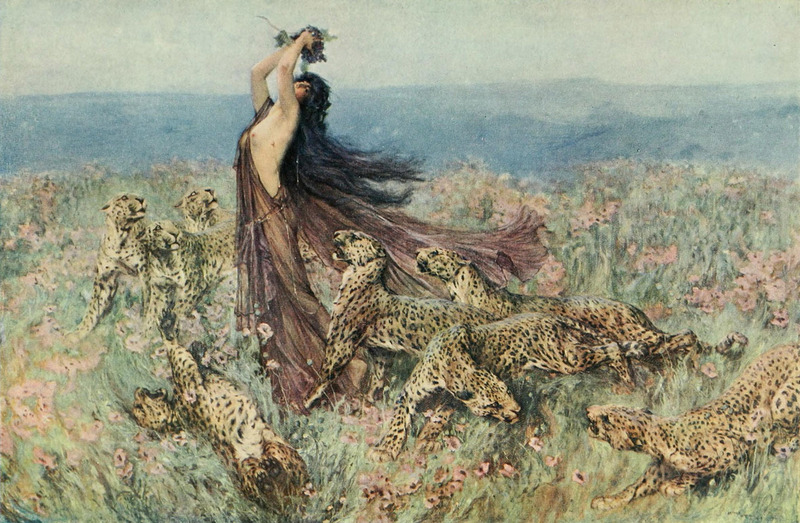 It will be a Lammas Full Moon Celebration embracing the wild, uninhibited parts of ourselves by freeing our stifled spirits and connecting to the primal energy of the ancient Greek Maenads. 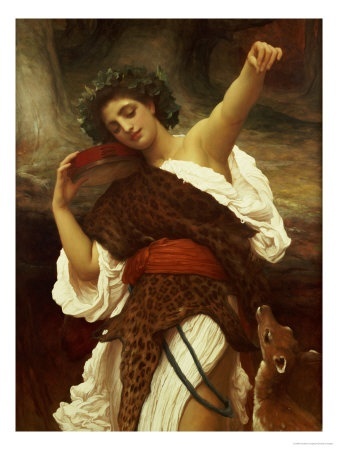 It will be a Maenad celebration, focusing on our inner Wild-Child (a.k.a, Dionysos) with a touch of Shamanic Journeying through the form of ecstatic Dance. 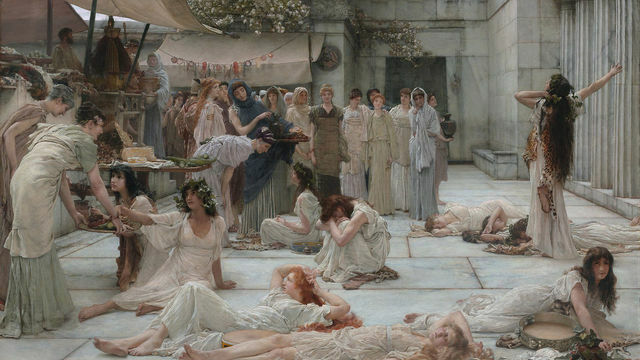 Every month during the Full Moon the Maenads of Ancient Greece joined together to honor Dionysos their inner-Wild Child. With the light of the full moon to guide them, women from all walks of life ventured from their homes to meet with others at their sacred gathering place to escape their mundane life and the pressures to ‘behave’ that society placed upon them. Their private sanctuary was a safe space that allowed them to fully let go of all the societal inhibitions that stifled their Spirituality. As the Ancient Maenads of old, we too are free to unlock our imprisoned pleasures and and ultimately unleash the Divine Madness that beats in the hearts of all women. This is the Center of our healing and the core of the Sacred Feminine. Since becoming initiated as a Maenad well over a decade ago, I have evolved both as a Woman and a Priestess. During these years of contemplation I could feel a slow-budding awakening but it wasn’t until about a year ago that I began to understand what my feelings were telling me. This shift in perspective came about naturally as I was preparing for my solitary Full Moon Ritual. A voice inside me whispered, “Bring forth the Maenad within you.” This gave me pause because it had been years since I had worked with that part of myself, but at the same time my heart screamed, “Oh how I have missed her!” But how would that work? Dionysos had always played a major role during Maenad rituals, but over time my spirituality had grown far apart from that aspect. Yes, I am a heterosexual woman, but the state of arousal went well beyond that. There had to be a way for me to take on the challenge of unleashing the Divine Madness of the Maenad. So I took a deep breath, trusted my intuition, and reworked my Full Moon ritual to awaken my inner Maenad and to give thanks to the Goddess for inspiring me to do so. When it came time to raise power, I took my own journey into the ecstatic trance state. I built power by the light of the Full Moon and then raised that power by dancing to the rhythm of my own heartbeat. I was able to bring forth the liberating feelings that come with intoxication, but without the wine. I held onto the magick and revelry, and embraced the ecstasy of the moment. I transcended my chronic pain by allowing the frenzy to take me twirling naked in the full moonlight, laughing and spinning until I felt the reawakening and collapsed from the mystical dizziness of it all. The Maenad from within had been reborn, and it felt absolutely amazing beyond words. Occasionally I will post new developments in my progress as I develop the ritual. I hope you follow my journey as I prepare for this event.